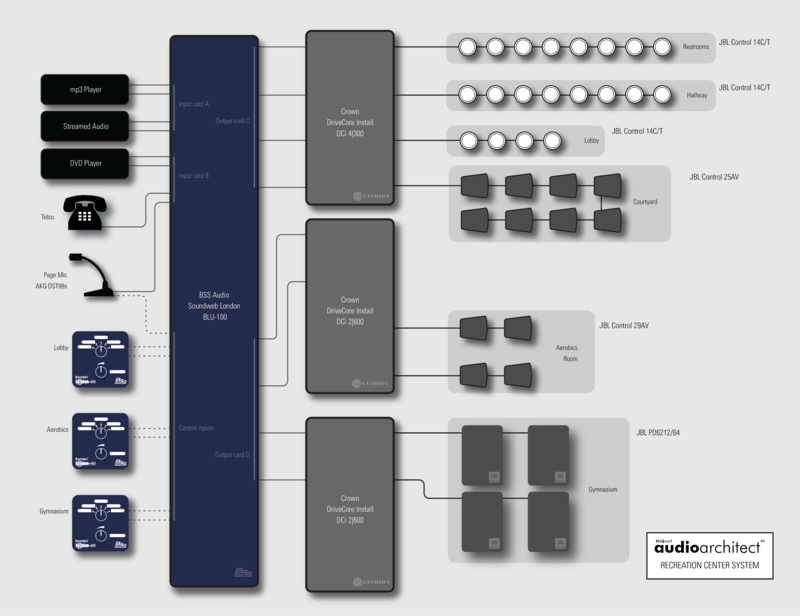 Multiple audio sources, in this case, an mp3 player and multiple satellite receivers often have a significant difference in the level of their audio outputs. This variance needs to be controlled so that the levels of all audio selections are relatively constant. By using the Soundweb London Leveller within HiQnet Audio Architect, automatic adjustments are made to compensate for discrepancies between the levels of each track. This results in an even volume level during playback. After passing through the Leveller, the signals are then equalized using a Parametric Equalizer (EQ). This processing object can be used to adjust for the acoustics of the room and help make the system pleasing to the ear. A well-tuned EQ also assures the highest intelligibility of voice announcements throughout the system. Depending on the facility and the wishes of the designer, music can be sent to the amplifiers / loudspeakers as either stereo or mono signals. In this design, it was desired to have portions of the system in stereo, while other parts of the facility employed mono audio feeds. To accomplish this, the audio source was duplicated. The signal was sent to a Summer processing object to create a mono source for the hallways, restrooms, courtyard and lobby areas. At the same time, the signal was kept as a stereo feed and sent to the aerobics and gymnasium zones for playback in stereo. 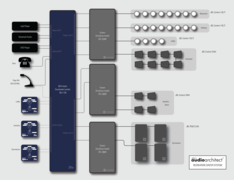 Source Selectors, controlled by BLU-3 analog remote wall controllers mounted in three parts of the facility (lobby, aerobics room and gym), select the audio source for that particular zone. Facility staff can also use these wall controllers to adjust the audio level (volume) in each of these zones. By using the Ducker processing object, a true override paging system has been designed that will automatically “duck” the background music (reducing it in level by a prescribed amount), so that announcements can be clearly heard above the level of the music. Upon completion of the announcement, the background music is automatically restored to its previous level. Duckers used in this way allow clear paging, whether the source is a paging microphone or Telco (telephone) interface. Please note that in the Properties window of the Ducker the “Mic feed to output” box is unchecked by default. Check this box to ensure that the Telco and Paging Microphone signals are heard at the outputs.